Update: (Friday AM) I have a new post with the latest developments in the “Carnival of Zarqawi Rumors” here. Update: Top US Official confirms Zarqawi injured. And, Iraq Officials are confirming Zarqawi is injured. 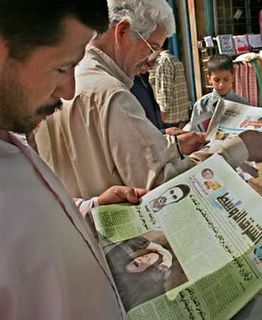 Iraqis are obviously following the news of Zarqawi’s fate. A Web site statement posted Thursday and signed in the name of al-Qaida in Iraq said the militant group has appointed an interim leader for Abu Musab al-Zarqawi, who’s purportedly been wounded. But a subsequent posting shortly afterward disputed the claim. The authenticity of the postings could not be verified. The latest statements follow recent rumors and claims that al-Zarqawi has been wounded, possibly by a bullet penetrating his lung, may have been taken out of Iraq for medical care, or had possibly died. “The leaders met after the injury of our sheik, Abu Musab al-Zarqawi … and decided to appoint a deputy to take the lead until the return of our sheik,” the first posting said. It was posted on a militant Web site that two days earlier announced al-Zarqawi had been injured. But a rival posting a short time later that was signed in the name of the usual poster for al-Qaida in Iraq denied the militant group has appointed a deputy. “We deny all that has been said about appointing the so-called Abu Hafs or anyone by any other name,” the statement said. Middle East experts on Islamic militants told The Associated Press that the man said to be the new deputy leader is a Saudi who has been al-Zarqawi’s military adviser and is the emir, or prince — as senior commanders are called — of the military committee of al-Qaida in Iraq. None of the Internet postings and rumors have been confirmed, but the amount of speculation about the Jordanian-born militant has been unusual both in size and scope. Analysts pointed to the lack of a denial from Zarqawi’s supporters, who have been quick to rebutt previous US and Iraqi boasts of successes against leading aides of the Al-Qaeda frontman. “The announcement has a certain credibility because it is signed by Abu Maisara al-Iraqi,” the nom de guerre of Zarqawi’s designated spokesman, said London-based journalist Abdel Bari Atwan, who has been a close follower of Al-Qaeda affairs since interviewing Osama bin Laden in the 1990s. Instapundit is carrying this story. Austin Bay has more on the “myth that is Zarqawi”. Athena has been following the news. Update: (7:00 PM) So is all of this speculatin just a power play within Al Qaeda? Update: (8:25) FOXNews is saying “Deputy” Abu Hafs al-Gerni is to take over. “Like Hitler in his bunker, this violent extremist, failing to advance his political objectives, now appears committed to destroying everything and everyone around him,” said Rumsfeld. …We made the initial announcement (about wounding of Zarqawi) for no reason other than to demonstrate the credibility of our media practice. Your brothers in Al-Qaida organization in the Land of the Two Rivers will not slow down or stop Jihad until religion becomes Allah’s in its entirety.